Hhelp Alissa and Bunbun get back home in this sweet match-3 adventure! Join Alissa and her sidekick Bunbun in this sweet match-3 adventure! 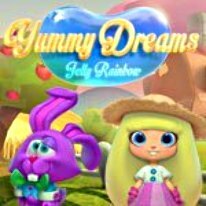 Find your way out of a dream-world filled with sweet jellies and help them get back home by using your match-making skills to solve thrilling puzzles! Combine sugary power-ups and puzzle out sweet challenges in this one-of-a-kind match3 game!